Covidien 7086 Excilon 4 x 4 Inch 6 Ply I.V. 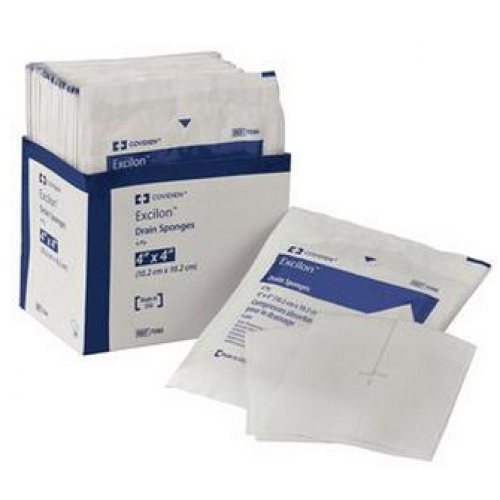 Drain Split Sponge are highly absorbent, fast wicking gauze sponges used in wound care. This IV drain sponge offers a lower-cost alternative with a pre-cut notch that conforms well around drains, catheters, chest tubes, IVs, and tracheostomies. It is virtually lint-free, which minimizes the risk of wound contamination. The sponge pads are drain split gauze that eliminates the need for sterile scissors and conserves nursing time. 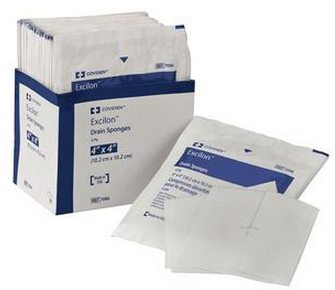 Excilon Trach Drain Sponge are sterile and individually wrapped. After shopping for these on line, I found Vitality had best prices. I have used this Drain Sponge for many years and will continue to buy from Vitality. They have very good Customer Service, when I have had a small problem with one order. I always receive them on time. This is the best place to buy this product, fair price and good delivery time. Just what I wanted without being able to see it before purchasing. Since insurance quit paying for these pads I had to do something. I looked on several sites before choosing this one. The price was good, we recieved them in a timely manner and was exactly what I wanted. Very satisfied and will be ordering again. I use these sponges around my j-tube. I have constant drainage, sometimes worse than others. I change the sponges as soon as they are soiled in order to keep the ara dry and infection free. I can't imagine using anything else. They are soft, nonshredding, an anti bacterial property in them. Love these sponges! I'm a trach patient buying my own supplies and I have found no other drain sponge that comes anywhere close to being half as good as these. They are very absorbent and don't leave any fuzz or strings behind like others do. I don't buy anything else, EVER! Amazed at how fast the order was filled and sent. Product was what I wanted and works perfectly.